NOTE TO READERS: For the remainder of this week (4/17-19), our afternoon cable posts, which usually go up around 1:30PM PDT, will likely be posted around 5PM PDT, with text to follow. NETWORK FINALS: Live sports meant adjustments, with ABC’s NBA PLAYOFFS game ending up at 1.5, and NBC’s NHL PLAYOFFS game at 0.5. CABLE HIGHLIGHTS: ESPN’s NBA PLAYOFFS game led Saturday cable at 1.02/0.83/0.82, with its primetime UFC PRELIMS at 0.39. 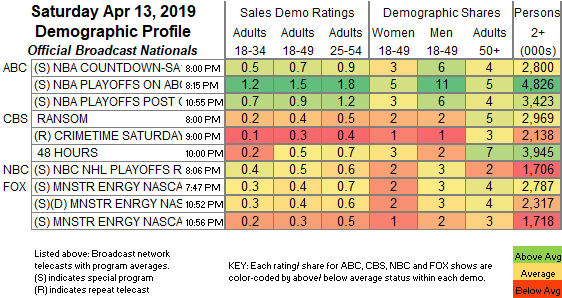 A&E’s LIVE PD gained 0.04 to 0.67. Adult Swim’s line-up performed as follows: DRAGON BALL at 0.41 and at 0.09/255K & 0.08/241K, compared to last week’s 0.39 and at 0.11/322 & 0.14/343K, MY HERO ACADEMIA up 0.06 to 0.30/619K, PROMISED NEVERLAND at 0.27, SWORD ART ONLINE 0.27 compared to last week’s 0.19/0.20, JOJO’S BIZARRE ADVENTURE up 0.04 to 0.22, BLACK CLOVER up 0.04 to 0.21/417K, BORUTO down 0.13 (in a later timeslot) to 0.17, NARUTO up 0.03 to 0.17/316K, HUNTER X HUNTER steady at 0.15/277K, and ATTACK ON TITAN up 0.02 to 0.13/232K. Hallmark’s movie BOTTLED WITH LOVE was at 0.27. Nickelodeon’s morning ALVIN & THE CHIPMUNKS rose 0.05 to 0.23. NBC Sports Net’s NHL PLAYOFFS game was at 0.22, and CNBC’s game was at 0.15. Golf Channel’s LIVE FROM Masters coverage was led by the 1PM hour at 0.22. ID’s MURDER DECODED gained 0.05 to 0.21. 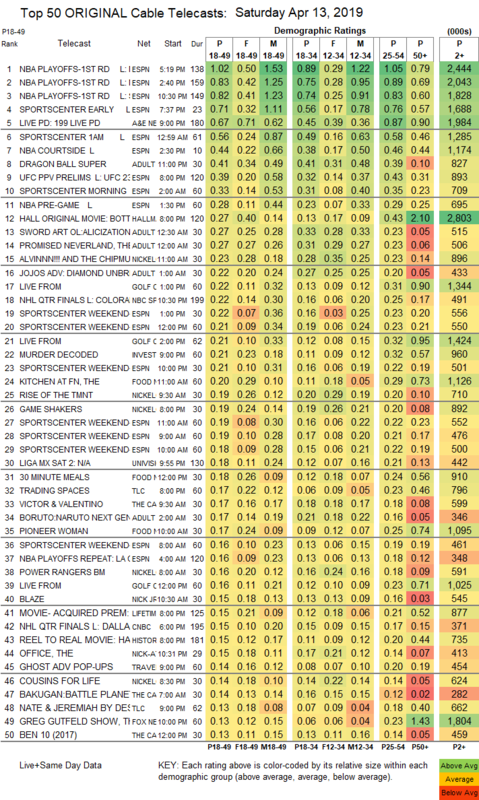 On Food Network, KITCHEN AT FN edged up 0.02 to 0.20, 30-MINUTE MEALS was up 0.03 to 0.18, and PIONEER WOMAN was at 0.17. On TLC, TRADING SPACES gained 0.02 to 0.17, and NATE & JEREMIAH BY DESIGN was at 0.13. On OWN, FAMILY OR FIANCE rose 0.03 to 0.11, and BOOK OF JOHN GRAY ticked up to 0.09. Syfy’s ALIEN NEWS DESK ticked up to 0.05. Do you have the ratings for both Inazuma Eleven Ares as qell as Beyblade Burst? My Little Pony Friendship Is Magic 11:30AM on Discovery Family? Do you have Beyblade Burst at 8 AM and the Series Premiere of Inazuma Eleven Ares at 8:30 and 9 AM on Disney XD? Do you have 18-34 numbers for My Hero Academia (11:30 PM, Adult Swim’s Toonami) and Black Clover (1:30 AM, Adult Swim’s Toonami)? Just trying to establish a baseline here. Sorry, we can’t provide more detailed ratings for those shows than we already do. That’s rather more of a request than we would handle here. But it’s irrelevant, because they were all reruns, and we don’t provide those ratings in general. What I believe the person above is trying to ask is what the ratings for that day are given that you once looked at Disney Junior rerun ratings on March 9 with Vampirina, Muppet Babies, and Fancy Nancy . MLS on ESPN2 – 5 et (Minnesota vs NYC)?